You'll also be able to take off your own head. On November 22nd, Pixar is set to release its latest animated masterpiece. It's called Coco, and one of its central themes is Dia De Los Muertos, a Mexican holiday that honors the dead. To help promote the film, Pixar partnered with Oculus to produce its first-ever VR experience. Aptly named Coco VR, it was announced back in October, but is now available starting today for all Rift headsets (A Gear VR version will be out next week). I tried an early preview of it a few days ago and I found the experience to be whimsical, educational and, surprisingly, fun. To be clear, Coco VR is not a game. There are no set objectives or tasks to be completed. Instead, Pixar calls it a "social adventure," where you and your buddies get to embody skeletal characters and roam freely in the Land of the Dead. "It's an opportunity to step inside a Pixar film and go on an adventure with a friend," said Marc Sondheimer, a Pixar producer. "We wanted to teach people a little about the film [...] learn about the holiday, the festival, and the traditions." 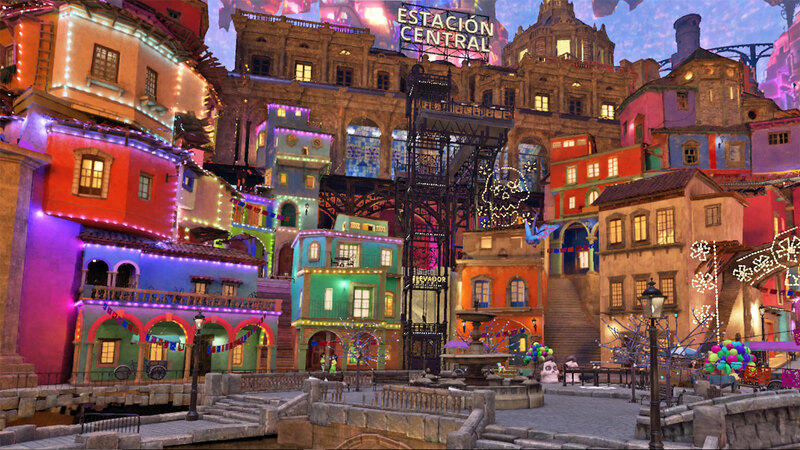 As for why Coco VR is made to be social, well, Sondheimer said it's just more fun that way. "It's the idea of being a skeleton in the world, [while] seeing other skeletons," he continued. "It's an easy way to believe you're in an experience with someone else." 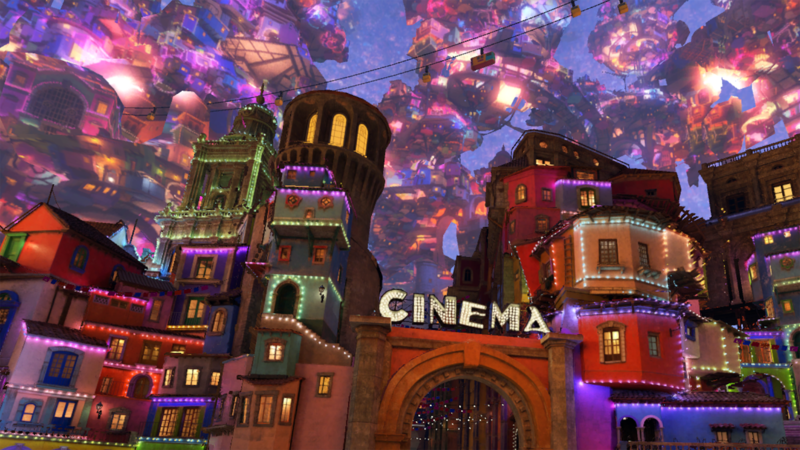 You can still experience Coco VR solo, but as Pixar describes, it's really meant to be enjoyed with other people. The Rift accommodates up to 4 players, while the Gear VR supports up to two. Whether solo or with someone else, the Coco VR experience starts with meeting Miguel, the star of the movie. He's standing in front of what looks like an ancestral altar, with candles and framed photos of deceased relatives. Miguel greets you, and starts to describe Dia De Los Muertos. But before he can get any further, he's distracted and leaves the room. When he's not there, the room somehow goes dark. The next thing you know, you're in some kind of wardrobe room, you're standing in front of a mirror and, oh my, you and your friends are now animated skeletons. You're now in the Land of the Dead. From there, you're free to customize your look. A small version of yourself is perched a top the dresser, along with a rack of skulls and clothing items. You can drag and drop different skulls and clothes onto to that tiny representation of you, to see how you look. There's also that aforementioned mirror where you can check yourself out in more detail. Amusingly, you can even, well, take off your skull entirely and walk around in a disembodied state if you fancy. To get your skull back, simply pull back on both Touch joysticks, and it'll return. When you step out of that wardrobe room, you'll find yourself in what looks like a festive town square. While I didn't have any friends to test out the experience with, an Oculus representative was there to act as my skeletal tour guide. Moving around in the game is fairly straightforward; you use the Touch joystick to teleport yourself about and to change directions. I could then choose to walk over to a concert, the cinema, an art gallery, a gondola ride or just wander around a fountain and its surroundings. There's even a photo booth where you can take a virtual selfie. 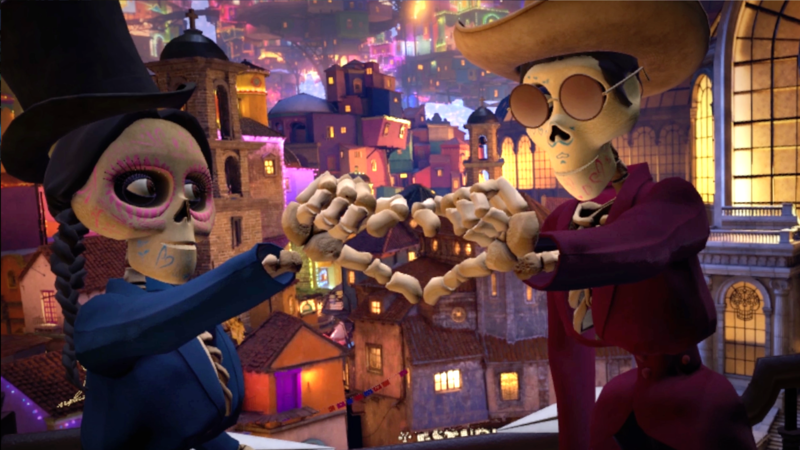 Tucked away in these destinations is more information about Dia De Los Muertos and Coco, the movie. If you scrounge around the dresser drawers, for example, you'll find concept art and actual film storyboards. The film shown at the town square cinema is actually never-before-seen footage made by Pixar as a test run. One of my favorite places is the art gallery, where I saw examples of Mexican art and learned about their history and who the artists are. It even has an area where you could paint your skull face with a variety of different colors. The best part, for me at least, is towards the end, when the gondola ride takes you through the skies, revealing the colorful and magical city beneath. Somehow, it all culminates with you on stage, with the host inviting you to dance, with or without maracas in hand. The scene then cuts to black and you're back with Miguel again. Apparently you were dreaming. Or maybe not. And that's the end of the Coco VR experience. On the whole, I found the experience to be an enjoyable one. It was like going on a theme park ride, except it all happened in a VR headset. 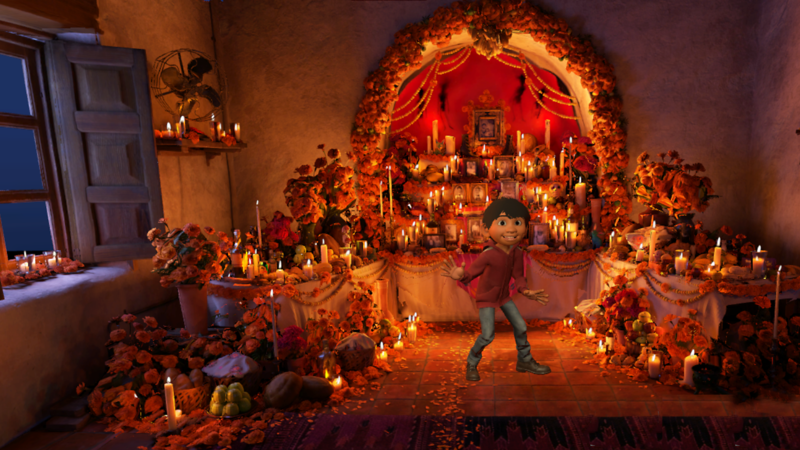 The environment in Coco is really quite beautiful and I loved the art, the attention to detail and the feeling of being transported to another world. There were multiple times when I wished it was all real, because I really would like to visit this imaginary place. That said, don't expect perfection -- sometimes it took several tries before I could grab onto items, and I wish the controllers provided some sort of haptic feedback when you interacted with items in the world. And you can't really interact with many of the characters you come across, which is unfortunate. Still, as this is supposed to be a social experience, Pixar probably wants you to be interacting with your friends instead. "The social aspect is really important," said Colum Slevin, the Head of Experience at Oculus. "I love the idea of giving people room to breathe and spend time with a friend without the intensity or the artificial barrier of having to complete tasks [...] It's like a day at the fair." Pixar faced a number of challenges in its first virtual-reality project, one of which was losing control. "We're kind of control freaks at Pixar," laughed Sondheimer, adding that it was a little unusual to have other companies come in to help create the world instead of doing everything themselves. Pixar would create the animations, and then hand them over to Magnopus, an LA-based studio that specializes in interactive experiences. Magnopus would then recreate those animations in VR, adding social and interactive layers to them. A particularly big part of losing control is the fact that participants have free reign to go wherever they want in the Coco VR world. This is completely different from Pixar's traditional linear storytelling. "We're known for making narrative that involves a lot of animation," said Sondheimer. "But this is about finding that dial of where you throw narrative at the user, versus how much you let them go play." He explained, for example, that at some points, users are too busy playing with instruments and completely miss important points of dialog. "That's the challenge. How much can you do narratively, and how much can you do experientially." "That's the key difference between traditional linear storytelling like film," said Oculus' Slevin. 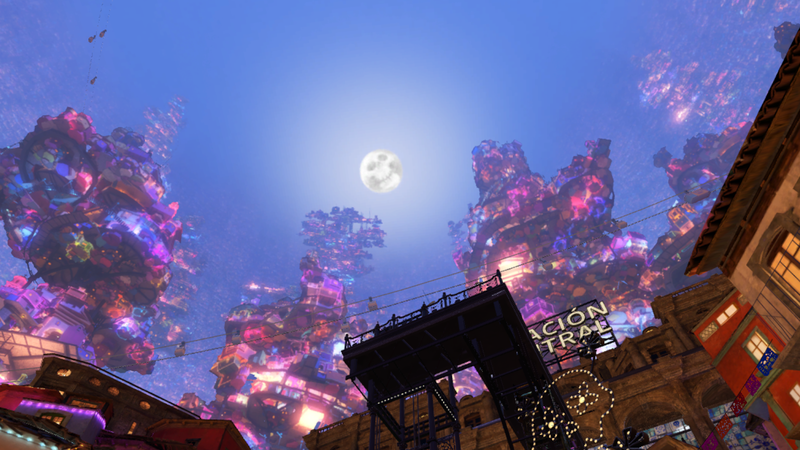 For Coco VR, there is indeed a story, with a beginning, a middle and an end. The difference is, you take your own route through it. "In the middle, you can go through the places in any order, you can repeat things," explained Sondheimer. "But to trigger the end, you have to take the gondola and then get on stage." Yet, the experience doesn't tell you to do any of that. It all happens naturally, at your own pace. "If you end up forcing someone down a track on rails, it ultimately doesn't end up being a pleasant experience," said Slevin. You accept that contract in a movie, he added, but with VR, you need to answer the fundamental question: "Why are you trying to make this in VR? Why is this a VR experience?" The answer, according to both Pixar and Oculus, is that VR will immerse you in the world. One thing that makes Coco VR particularly immersive, according to Slevin, is that you become a skeletal character. "It is one of the best examples of credible, believable embodiment," he said. "You really believe those are your hands even though they're goofy skeleton hands." "Ultimately, we want to represent the movie," said Sondheimer. "We're super proud of this film, and the world of this movie, and what the film means. We wanted to represent as well as we possibly could in this experience too." While Sondheimer wouldn't say if Pixar would create more VR experiences in the future, he did say he was excited about the medium. "There's no telling where this will all go for us," he said. "We're excited about the possibilities."